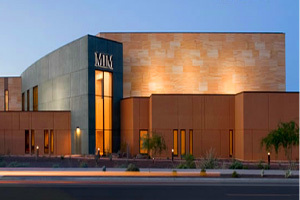 Musical Instrument Museum (MIM) offers a shared experience of the history of musical instruments throughout the world. The 200,000 square-foot space is bright and open, providing guests with a warm and comfortable environment. The collection includes instruments from around two hundred countries and territories in the world. Some larger countries such as India, China, Russia, the United States, the Democratic Republic of the Congo, and others have multiple displays with subsections for different types of ethnic, folk, and tribal music. The instruments have both historic and artistic merit and many are more than fifty years old. MIM’s goal is to acquire instruments that have been used for folk and tribal occasions wherever possible.